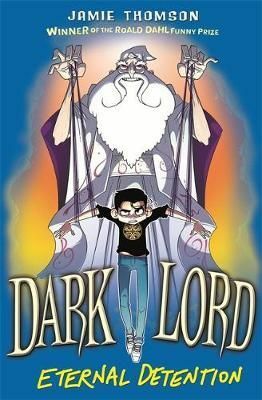 Dirk Lloyd, the Dark Lord trapped in the body of a weedy schoolboy, returns in another darkly hilarious adventure... Brilliantly funny and subversive, this is the Funny Prize-winning Jamie Thomson at his best. Dirk Lloyd, the Dark Lord trapped in the body of a weedy schoolboy, returns in another darkly hilarious adventure...Brilliantly funny and subversive, this is the Funny Prize-winning Jamie Thomson at his best. Fear me, o miserable worm! I, the Great Dirk, take up my pen once more to record the utter misery that is SCHOOL. My sworn enemy, Hasdruban the White, has infiltrated Whiteshields School and seeks vengeance on me. Naturally, I will triumph. But it is the Dirkest Hour indeed...BUY THIS BOOK OR SUFFER ONE OF THE FOLLOWING: -Being struck with a Blast of Ravening Flame -Banishment to the Slave Pits of Never Ending Toil -Torment by the Hewer of Limbs THE CHOICE IS YOURS. MWA HA HA!